Honestly, I didn’t know what to expect coming into my first Redbird Migration in October. I knew there would be other flight instructors there, and I knew we’d talk about flight simulation, but really, beyond that I was as green as the swamps of Louisiana I overflew on the six hour journey from Florida to San Marcos, Texas. What I found when I got there was so much more than just a chance for CFIs and flight schools to network. The Redbird Migration 2016 let me peek into the world of a whole new breed of flight instructors and the schools they work with. These are true educators, people bent on doing more than making a living at flight training—they really want to learn to use the newest tools available to innovate and take flight-training education to the next level. And by doing that, they can more efficiently and effectively educate the next generation of pilots, who, if you believe the statistics coming out of The Boeing Company, better be a big generation! Forecasts for the growth of commercial aviation in the next two decades repeatedly call for needing a half million newly minted pilots to fly. And that’s just commercial aviation (read that airlines). We’ll need more for everything else. 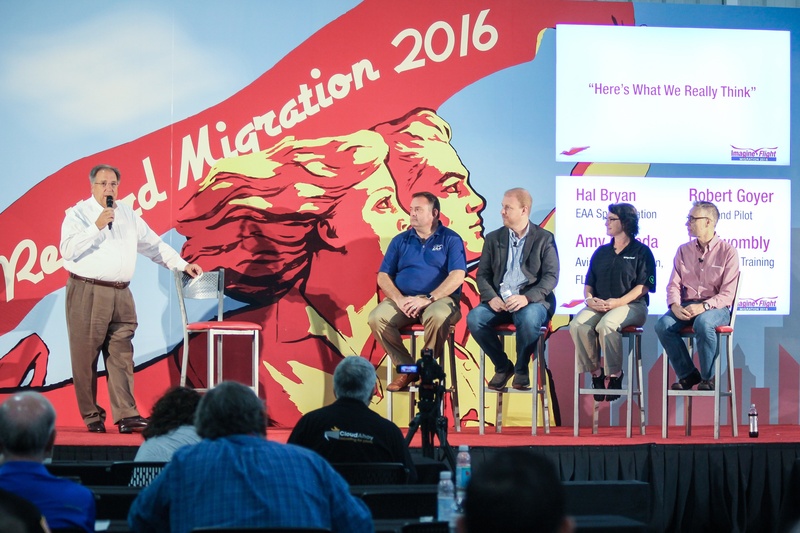 Migration 2016 was chock-full of new technology for educating those pilots. There were, of course, the Redbird Advanced and Basic Aviation Training Devices, and I sat in on a couple of great seminars on how they work and more importantly, how flight schools can use them to keep students progressing even when the weather outside stinks. Redbird's Charlie Gregoire taught new sim owners about how flexible the systems are, and the best way to reconfigure them quickly. He also talked a lot about the new instructor station coming out, Navigator, and how easy it is to set up scenario training for a student with the app. Related: Is This the Secret Sauce to Getting More Customers? Instructor and early Redbird sim adopter Michael Phillips taught the group how to integrate a sim into a school’s flight training program. “You’ve got to designate a Sim Captain, someone on your team who can integrate the simulator into both the syllabus and the business plan for your school,” he told the group. “For your students you need to make sessions real to make them valuable training,” he continued. This means real nav data, even using EFBs that connect to the sim via wifi, so students can experience flight the exact way they’d see it in the cockpit. He also talked about the PilotEdge product, which can infuse your scenarios with realism via realtime, live ATC transmissions. Redbird Founder Jerry Gregoire presented a seminar on the company’s R&D projects, including a build-your-own sim product called Alloy, the Sidekick data logging product and its integration with CloudAhoy’s digital recording and debriefing products, which, if used in conjunction can actually have the capability of auto-populating a Foreflight pilot log, instructor logs and equipment logs—even auto-generating a customer invoice. Imagine it—the lesson is done—and so is the paperwork, all at once. Gregoire also invited the head of the FAA’s Part 141 Branch to take questions and commentary from the flight school participants in his seminar, and the discussion was a lively one! That FAA program manager had a lot to think about on his trip back east the next day. I loved watching AOPA videographer Paul Harrop talk about how he works to transmit the heart of a story in a compact visual moment. Redbird certainly knows how to do that (have you seen “Winging It: The Road to Oshkosh”?). Cirrus co-founder and CEO Dale Klapmeier talked about how the company came to the conclusion that it needed its own specialized training program for its fleet. Redbird’s Roger Sharp made the case that flight instructors can make or break a flight school’s business (so take the time to train them in customer service) and President and CEO of PASSUR Aerospace James Barry really opened my eyes to how big data is rapidly changing all aspects of aviation today—for the better. Team building was, next to networking and education, a key component of the two-day event. Participants were tasked with forming groups and designing and building an aircraft from a box of parts and pieces (seriously—and you could use the box, too!). Aviation engineer and designer of the electric airplane Sunflyer and CEO of Bye Aerospace George Bye was one of a series of judges recruited to select the winner of several categories, including: best product name, livery, and sale pitch; most unique overall design; least likely to find an insurance underwriter; longest time aloft; shortest takeoff distance under its own power. The winning designs included a VTOL machine, an expertly “painted” but not necessarily well flight-tested biplane, and a variety of self-launching, not-quite-ready-for-primetime birds. The runway for the final flight contest was hewn from the center of the supper venue, much to the chagrin of the catering staff, but it had to be done. That night AOPA’s Director of Flight Training Initiatives Chris Moser and Senior VP of Communications Katie Pribyl arrived to award that organization’s “Best Flight School”, “Best CFI” and “Student’s Choice” prizes to a few lucky winners in the group. I was thrilled to see two of the prizes go to a flight school and flight instructor from my hometown. I knew the school was good and referred people there, but, wow! I might not teach there, but I was still proud to have that kind of quality flight instruction going on in my community. And it was nice to see it acknowledged, too. The closing day of the Migration it was my turn to be onstage, as part of a panel of aviation journalists who took questions from Redbird Director Craig Fuller. Now, Fuller had just finished a q&a with the President and CEO of Piper Aircraft, Simon Caldecott, and I have to tell you he was a tough act to follow. We four journalists, myself, Hal Bryan, Editor at EAA Sport Aviation, Robert Goyer, Publisher, Plane & Pilot magazine, and Ian Twombly, Editor, AOPA Pilot and AOPA Flight Training magazines, filed up on the stage and took our chairs, and for the next 30 minutes we took questions from Fuller that stretched from what the different organizations did to foster enthusiasm in aviation to growing a new crop of general aviation pilots, to diversity in aviation, and more. Neither of us knew what the other would say, and that made it pretty exciting (at least from up on stage). The last question went to me. Fuller asked, “What do you take away from this, say, if you were writing an article?” Well, I told him, I’ve seen some things that absolutely energized me. Some of that was the opportunity to interact with a lot of different people from different flight schools, listening to what their successes and problems are. And then there was the revelation of what big data can provide. Last January I interviewed FAA Administrator Michael Huerta and he talked about how he has been changing the FAA based on just that: the information big data reveals. As a journalist when I start to see those synergies I realize I’m looking “change” right in the eye. I believe change in aviation is beginning to happen. But it isn’t happening on its own, it is happening because we are trying, and that is what Redbird Migration is all about. So, set this in your calendars for the Redbird Migration 2017: October 16-18 2017 at the EAA Air Museum in Wisconsin. If you haven’t been for the autumn colors you don’t know what you are missing. And if you haven’t been to a Redbird Migration, well, this next one is the one not to miss. See you there!